E.M. Forster's, A Room With A View, a dreamy sketch of Ponte Vecchio and Michaelangelo's statue of David in all his glory, come to mind whenever I think of Florence. 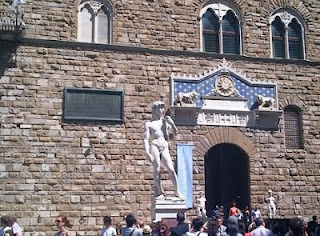 To sum up my short visit to Florence last July, it is all about a book, a bridge and a naked statue. 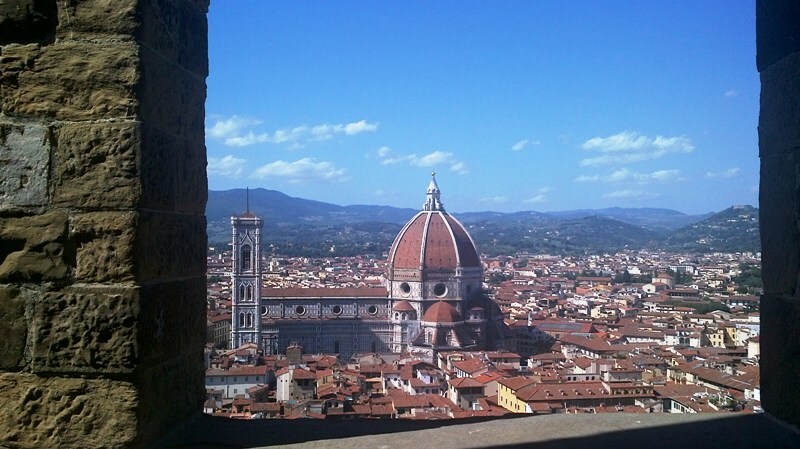 Of course, there's a lot more to see and do (or eat) in Florence. 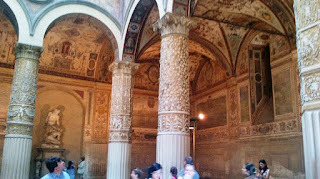 However, everything tends to become a blur after seeing and feeling so much "renaissance" in a couple of days. Walking the narrow streets of the historical centre of this UNESCO World Heritage city, can quickly give one a Florentine feeling. Just like the book. Piazza della Signoria, the town square, is the best place to start. Palazzo Vecchio, the city hall of the past and present day of Florence, is on one side of the square. I had walked into this humongous courtyard admiring the columns and the rich looking ceiling, before I actually realized I was already inside. Palazzo Vecchio is nothing like any city hall, hardly a hint of bureaucracy at work. The palace museum exudes magnificence floor to ceiling, befitting the Medici name. Cosimo de Medici, the patriarch of the Medicis, once lived here until he moved the family to Palazzo Pitti across the Arno. 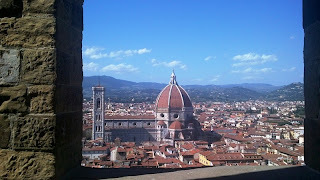 Up in the tower, is the postcard view of the romanticized Florence with the surrounding Tuscan hills and the river Arno. At the entrance to the Palazzo is the most famous naked man in history. A statue of David by Michelangelo flanks the main entrance. Seeing the outdoor version of David (albeit a copy but identical) can be a good excuse to skip the Academia Gallery where the real thing is. Uffizi Gallery is down the street from Palazzo Vecchio. Considered one of the largest, famous museums in the world, Uffizi is the home to Italian renaissance masters, from the more famous (Boticell, da Vinci, Titian) to the not so famous but interesting (Artemisia, Cimabue, Giotto). I found the most pleasant section at Uffizi in the outer corridor wrapped around the gallery halls. Marble sculptures from Greek to Roman to Byzantine periods, BCE to CE eras, basked gloriously in natural light from the huge windows. 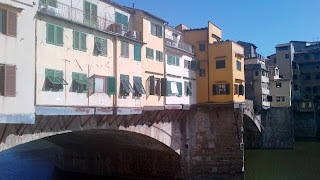 From one window in the corner, I caught a view of Ponte Vecchio. The "vecchio" or old in the name of the bridge is based in fact. 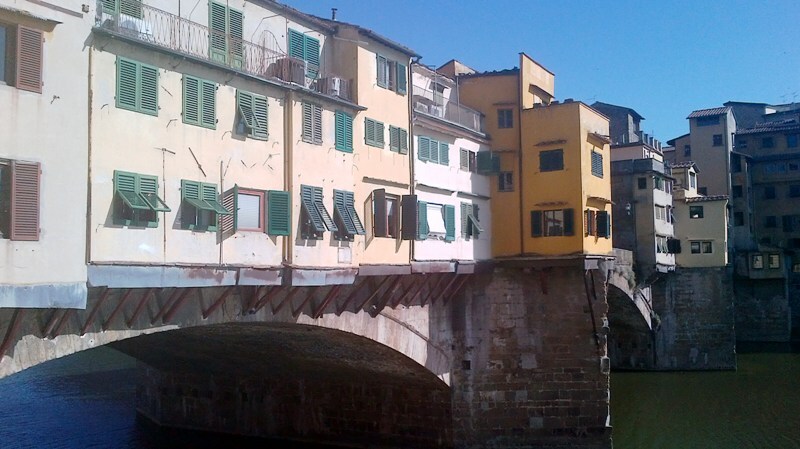 It is the oldest Roman bridge in Florence. Unfortunately, the structures on either side of the bridge resemble squatters and the bridge roadway is full of vendors. The bridge is best seen at a distance, just like a 19th century sketch I once saw. Of course, there is more to Florence than a book, a bridge and the naked statue. I can add the best melon gelato I've ever had anywhere yet and stuffed canelloni in a delicate white cheese sauce for lunch at the unpretentious Trattoria Le Mossacce.